2. Jaley Ella Brickey born 22 Feb 1896 in Scott Co., VA and died 20 Apr 1987 in Sullivan Co., TN. She married (1) Charlie Carter Hart. He was born 14 Feb 1891 died 30 Jan 1919. She married (2) John R. Fain on 03 Sep 1927 in TN. 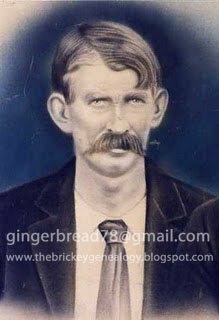 He was born 25 Oct 1887 in TN died 13 Apr 1930. She married (3) Wentz Lambert on 08 Sep 1944. He died 05 Aug 1965. John Fain and Ella are buried in Fain Cemetery, Sullivan Co., TN. 3. Marion Brickey born 1898 died 1898. 4. Lottie Beatrice Brickey born 09 Mar 1900 in Scott Co., VA and died 22 Oct 1925. She married Ray Fain Hickam on 13 Mar 1920 in Sullivan Co., TN. He was born 06 Jan 1897 in Kingsport, Sullivan Co., TN and died 15 Feb 1963. Lottie and Ray are buried in Arcadia Cemetery, Sullivan Co., TN. 6. Dovie Brickey born 23 Aug 1906 in Scott Co., VA and died 27 Aug 1906 in Scott Co., VA.